Muzahim Hussein's 1989 discovery of tombs of Neo-Assyrian queens in the palace of Ashurnasirpal in Nimrud (Kalhu/Calah) was electrifying news for archaeology. Although much is known of the Assyrian kings (8th/9th century B.C. ), very little was known about the queens, with the exception of semi-mythical Semiramis. Now, for the first time, not only were actual remains and burial objects of Assyrian queens discovered, but also names and attempts through curses to protect the burials. Elaborate gold jewelry and other items in the tombs rivaled in quality and quantity that found in Egyptian royal tombs. 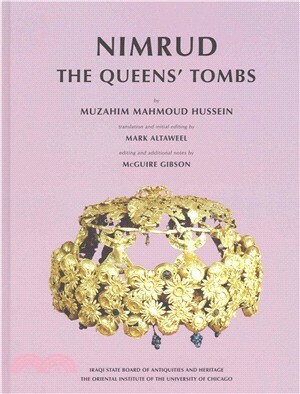 A short scholarly publication of a few items, as well as limited coverage in the world's press, gave only hints of the importance of the objects in the tombs. Planned international exhibitions of the treasures from the tombs had to be cancelled due to war and sanctions. Hussein and Amer Suleiman published Nimrud: A City of Golden Treasures, in 1999, under extraordinarily difficult conditions, that could not do justice to the objects. The present volume, a joint publication of the Iraqi State Board of Antiquities and Heritage and the Oriental Institute, is a new version of the finding of the tombs and their contents, giving much additional information derived from Hussein's continued analyses of classes of artifacts, accompanied by numerous full color plates.